Tomorrow, Winterfest starts at the Stamping Board at Two Peas in a Bucket. It runs 11 February to 19 February, with a hangover week after that. Here's the Master Thread with links to all the challenges. 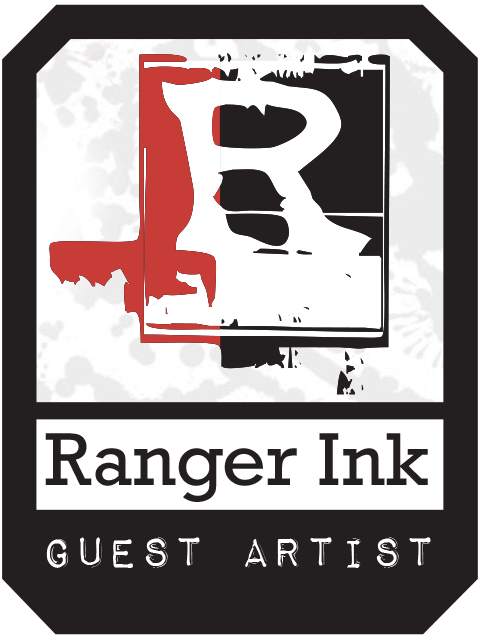 If you are a stamper and/or cardmaker and you have never visited the Stamping Board, please come over and say hi. 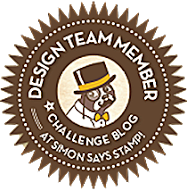 We are a very friendly group of stampers and we organise three challenge events every year. 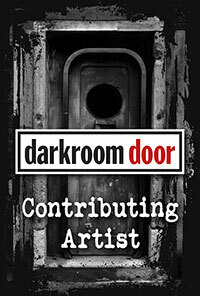 I always host a challenge, and this blog post is about my challenge for Winterfest 2012. Here’s a link to the Two Peas challenge blog for my challenge. 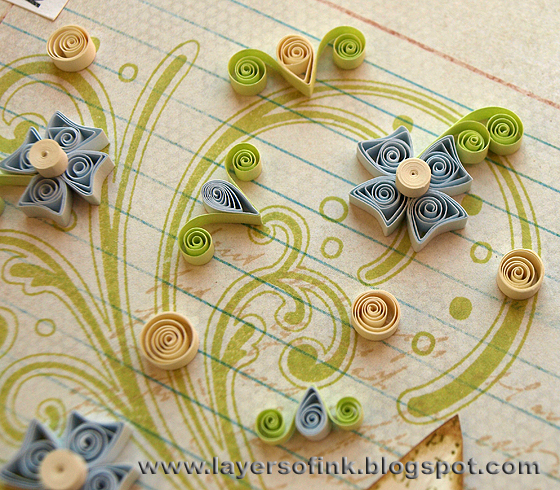 My challenge for WF12 is to combine quilling and stamping. Lately, I have seen more and more quilling again, so I thought it might be a fun theme for a challenge. When I first started papercrafting, I was very much into quilling, and I still like to add quilled pieces to my cards and layouts now and then. Quilling (also known as paper filigree) is an ancient craft, more than 500 years old. The basic technique is to roll strips of papers around a needle-like instrument. Long ago, feathered quills were likely one of the tools used for this. After shaping the rolls they are glued down to build up a design. It is pretty cool how many different designs that can be done with humble strips of paper, from very simple to very intricate designs. 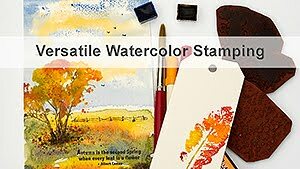 • Think of ways in which quilling can enhance your stamping, or in which stamping can enhance your quilling. 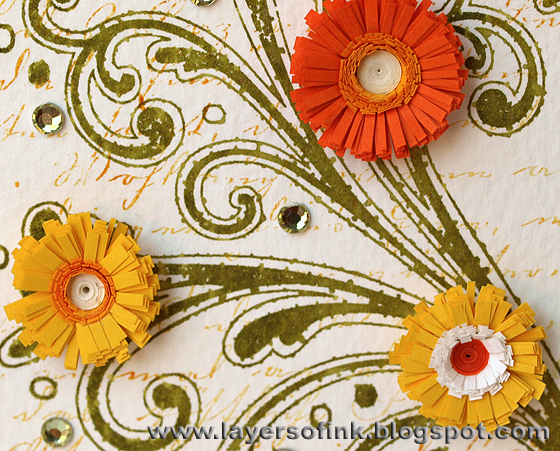 • Stamp a background for a piece of quilling. • Use quilled pieces as a border or frame. 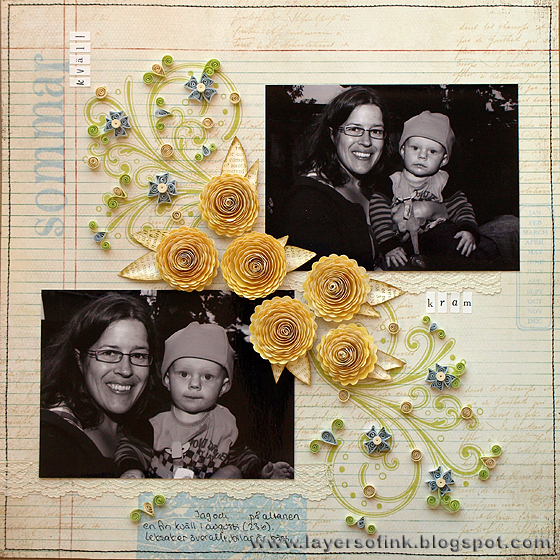 • Alter a stamped image into something else with the help of quilling. • Quilling can be elaborate or just simple pieces such as swirls, circles and other shapes. 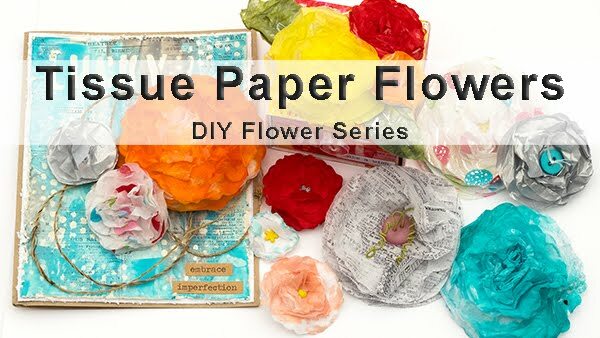 • You don’t have to use quilling paper. Instead, you can cut a thin strip of paper yourself, the width of which you need for your project. Just make sure that the paper is not too thick or too thin, about 100 gsm is a good weight. • You don’t have to use a slotted quilling tool, unless you want to. I almost never use the slotted tool (except for some folded flowers), instead I use a needle tool. Normally, I only start to roll a quill on the tool, and continue doing the rest of the rolling using my hands only. You can also use a hat pin or even a tooth pick instead. • Tear your strips at the ends instead of cutting them, it makes the glued edge much less visible. • Use a fast and clear drying glue. 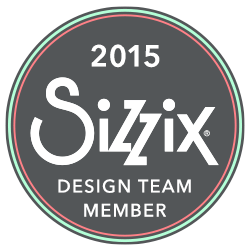 I picked out three projects which combine quilling and stamping as samples for my challenge. Only one of them have been posted on the blog previously. I will try to get another sample card done, as well as one or two tutorials, but not tonight. For the globe, I used packaging from a die cut. I used the die cut (mini ornamental) and it’s bigger sibling (ornamental) to cut the inside mat and the outside frame. The inside mat was stamped with Old Letter Writing using third generation Versafine Olympia Green and sponged with Bundled Sage and Peeled Paint Distress Ink. The latter two inks were used on the outside frame too, which was stamped with the Envelope Pattern. The packaging was very deep, so I could make quite a dimensional quilled garden, with lots of stems and leaves. The globe protects the quilling. I made four different types of flowers. The big one was made with the husking technique. I use a needle tool when I quill since I find that it makes much neater centers than the slotted tool. 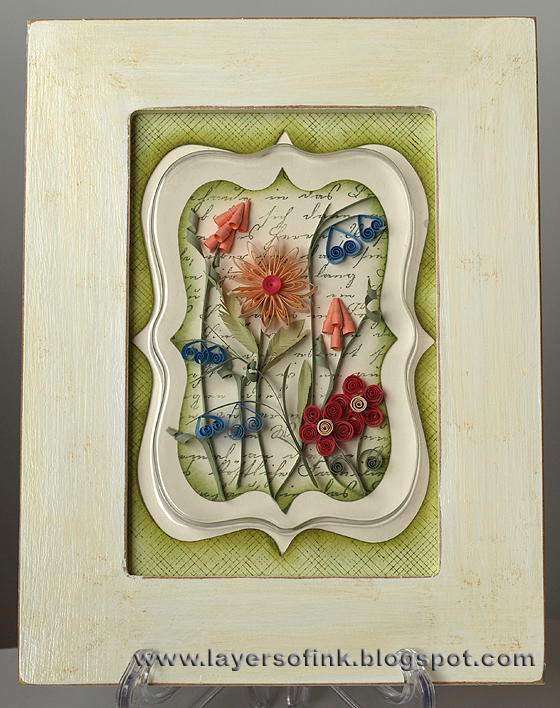 The quilled garden was inspired by Malinda Johnston's great book about quilling, The Book of Paper Quilling. I dug out an old blank frame. It was painted white and then painted with a cream wash and sanded down a bit, before varnishing it with a matt varnish. Supplies: Hero Arts stamps: Old Letter Writing S4878, Envelope Pattern S5507; Lake City Craft quilling paper (3 mm); Tim Holtz Sizzix Mini Ornamental and Ornamental die and packaging; Distress Ink Bundled Sage, Peeled Paint; Versafine Olympia Green; wooden frame; acrylic paint. I had so much fun making a bunch of flowers fort his layout (it was published in Scrapbooking.com Magazine, August 2010). All the quilling is done using 1/8” (3 mm) width quilling paper (you can also cut your own strips from paper). Tear sixteen 4” (10 cm) long strips of blue quilling paper, and an additional eight 5” (13 cm) long strips of the same paper. It is better to tear than to cut quilling paper, since the glued edge shows less then. Use a needle quilling tool (or a slotted tool if you rather prefer that), and roll a strip into a tight roll. Release it to form a loose circle. Apply a small amount of PVA glue to the end and glue it down. Pinch it to form a bunny ear shape. Repeat with the remaining strips. It is worth learning how to use a needle tool since it leaves much neater centres to quilled pieces than a slotted tool. You can also roll quilling papers using only your fingers. I prefer to start with a few turns on the needle tool and then roll the rest by hand. Tear six 5” (13 cm) long strips of soft yellow quilling paper. Roll as tightly as possible and glue the edge down without releasing. These tight coils are the flower centres. The leaves are made of open coils. Tear strips of green quilling paper (around 4”, 10 cm, long). Fold in the middle and roll each end toward the outside to make scrolls on each side forming a v-shape. On some of the leaves make the scrolls on the same side and of different length, for variation. Tear strips of white and blue quilling papers (about 2”-3”, 6-8 cm, long), roll and glue loose circles as explained above. Pinch on one side to form teardrop shapes. Glue these inside the v-scroll leaves. Glue four bunny ear shapes together to form a flower. Add a flower centre on top and leaves on the side. Tear twelve 3” (8 cm) strips of soft yellow quilling paper, roll tightly and release somewhat to form loose circles. Glue the end down. Supplies: Hero Arts stamps: Bold Flourish S5146), La Letter K5344, Friend Definition CG125, Birds n butterfly CL300, Happy letters CL385, Favourite Journal CL147; BG and Anna Griffin pp; MM letter stickers; Lake City Craft quilling paper; lace. One of the most popular flowers to make with quilling are fringed flowers, which can be made in many different variations. 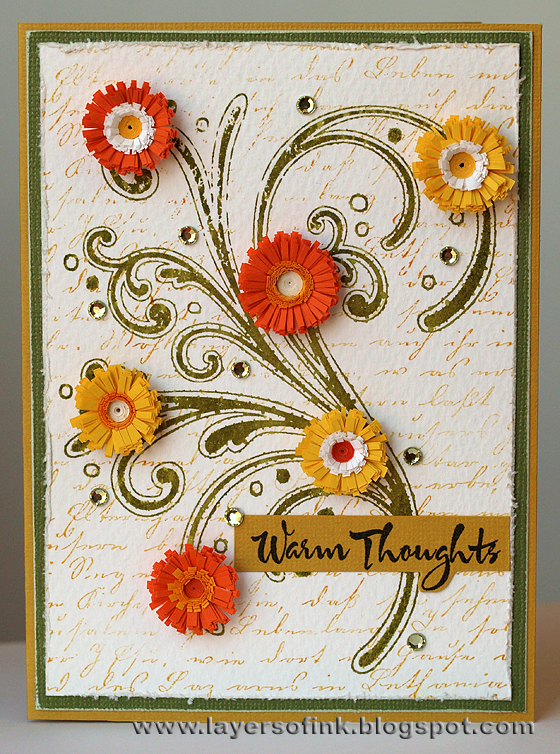 On this card, I made pretty basic fringed flowers (I’ll try to do a tutorial in a few days’ time). I used 3 mm paper for the flower centers, 6 mm paper for the inner fringed paper and 10 mm paper for the outer fringed paper. Three strips were glued together and rolled using a needle tool. The flourish stamp was inked with Peeled Paint, misted with Perfect Pearls and water and stamped on watercolour paper. The script is third generation stamping using Wild Honey. 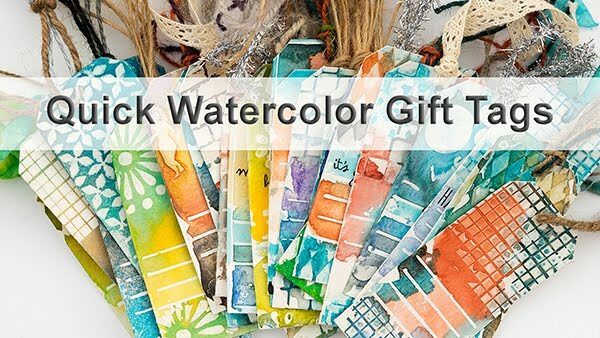 Supplies: Hero Arts stamps: Bold Flourish S5146, Old Letter Writing S4878, Find Joy CL497; Lake City Craft quilling paper; Distress Ink: Peeled Paint, Wild Honey; Versafine Onyx Black; watercolour paper; Core’dinations Peeled Paint cardstock; Kaisercraft rhinestones. Thank you for looking at this long post! 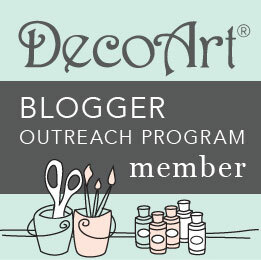 If you have any questions regarding quilling or my Winterfest challenge, just let me know. 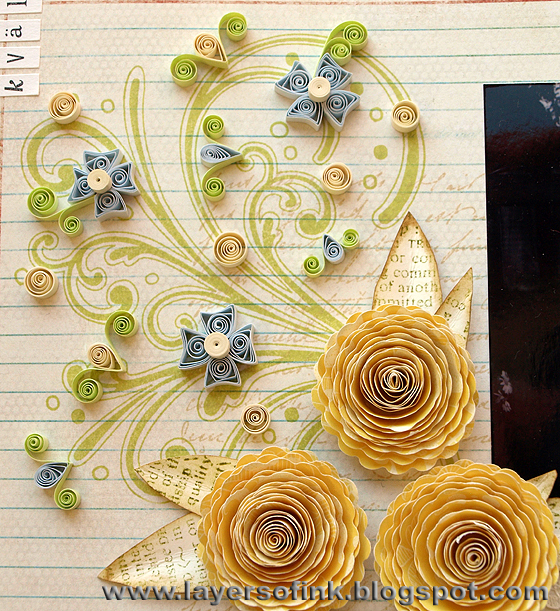 Gorgeous cards and perfect quilling! Your combination of quilling and stamping produces wonderful results. I especially like the flower garden. And thank you for the tips. These are stunning projects. Love them all. 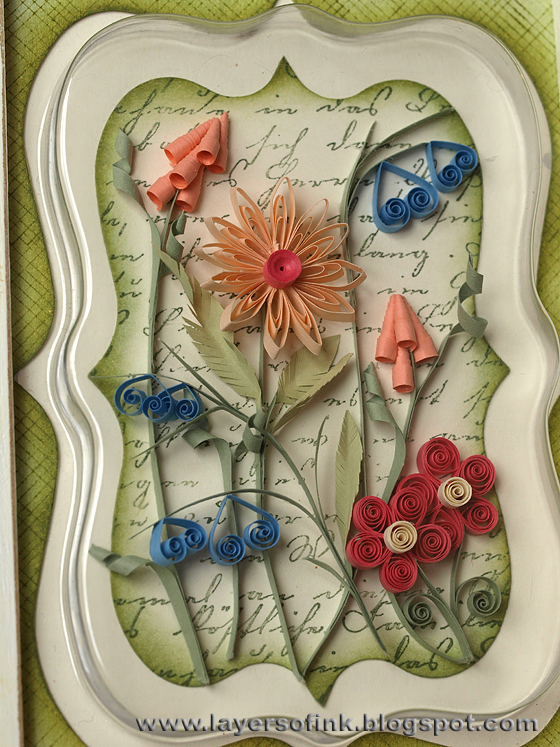 Very pretty projects and lovely quilling! I love the one with the stamped words on the background. Your quilling is very pretty and neat. Youve done a great job showcasing it. These projects are gorgeous! Thanks for sharing the supplies and awesome close up photos. Amazing job!!! So creative!!! Love all of them!! !